US Vice President, Pence meets with Ethiopian prime minister, applauds reforms – Royal Times of Nigeria. 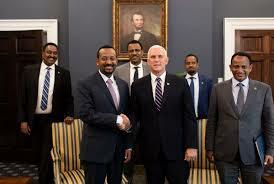 U.S. Vice President Mike Pence met with Ethiopian Prime Minister Abiy Ahmed on Friday and praised “the historic reform efforts” undertaken by Abiy since assuming power in April, the White House said in a statement. 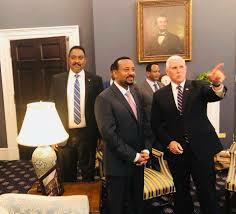 Pence noted Abiy’s efforts at “improving respect for human rights, reforming the business environment, and making peace with Eritrea. The two leaders underscored their countries’ shared values and their commitment to building an even stronger partnership in the days ahead. While in Washington, Abiy was also scheduled to meet with members of Ethiopia’s large diaspora community in the United States, whose remittances have helped prop up the economy. He is also due to visit Minneapolis and Los Angeles.